The United States has accumulated more than forty thousand tons of spent nuclear fuel and high-level radioactive wastes from commercial, research, and defense activities with an estimated two thousand tons added every year. The materials are currently stored in thirty-nine states at 131 temporary aboveground facilities, requiring constant monitoring and maintenance. Worldwide, scientific consensus holds that deep geologic disposal, with robust engineered barriers, can best contain and isolate these materials from the accessible environment. The Nuclear Waste Policy Act of 1982 established this approach as U.S. policy. If ultimately licensed by the Nuclear Regulatory Commission, Yucca Mountain, in southern Nevada, could become the first U.S. geologic repository for such materials. The Department of Energy (DOE) plans to open the proposed repository by 2010 if a license is granted. Between about fifteen and twelve million years ago, large volcanic eruptions deposited hot ash that solidified into the rock composing Yucca Mountain. The proposed repository would be built about one thousand feet underground and, on average, about one thousand feet above the water table in rock that has remained undisturbed for millions of years. For about two thousand feet under the mountain's surface the rock is very dry, or unsaturated, meaning its pore spaces are not completely filled with water. All materials sent to a repository would be in solid form. Spent nuclear fuel comprises hard ceramic pellets in sealed corrosion-resistant metal tubes. Liquid wastes from defense-related activities would be solidified into glass logs, inside sealed metal containers, before shipment. Groundwater contamination. Yucca Mountain's climate is very dry, with annual precipitation averaging about 7.5 inches (190 millimeters or mm). About 95 percent either runs off, evaporates, or is taken up by vegetation. Overall, very little water infiltrates the mountain and reaches the repository level. The bulk of any water moves very slowly through the unsaturated rock. Some data, however, suggest that water may reach the repository level in a few decades by moving through fractures that are large enough to permit this. Therefore, the sophisticated computer calculations used to estimate the repository's likely performance assume the presence of such fractures and their impact. After water has infiltrated the repository level, it must move down through approximately one thousand more feet of unsaturated rock to reach the saturated zone. Only from this zone can water be pumped to the surface. From Office of Public Affairs, U.S. Department of Energy. (2002). Why Yucca Mountain? Frequently Asked Questions. Washington, D.C., p. 10.
ground motion diminishes with depth, so earthquakes have less impact deep underground than they do on or near the surface. Transportation. Some people fear that vehicles moving nuclear waste across the country could be subject to accidents or become a target for terrorists. Federal regulations require that transportation cask designs be certified to withstand a series of severe impacts and extreme conditions without leaking radioactive materials. The regulations also require that shipments be monitored and tracked by satellite twenty-hour hours a day and accompanied by trained escorts, who must report in regularly. Armed escorts would be required through heavily populated metropolitan areas. Other Nations' Approaches. Some nations using nuclear power do not have economical sources of fresh uranium to make nuclear fuel. France and the United Kingdom, for example, reprocess their own spent nuclear fuel for a second usage; they also do reprocessing for other countries, such as Japan and Switzerland. Current techniques for reprocessing involve complex chemical and physical procedures and actually produce additional radioactive waste. Most nations with nuclear power intend to build their own geologic repositories. Health and safety. For more than twenty years, scientists and engineers have gathered technical data about the rock in Yucca Mountain, water movement through it, expected earthquakes, and the potential for volcanic disturbance of the proposed repository. Applying advanced software and high-powered computers to these data, scientists have estimated radiation doses due to the repository for tens of thousands of years. The radiation protection standards set by the Environmental Protection Agency (EPA) require that the calculations estimate the likely level of radiation that the most exposed member of the public would receive from the repository for ten thousand years after its closure. The standards require that this hypothetical person be assumed to live about fifteen miles from the repository, to eat some foods grown with local groundwater, and to drink two liters of water per day drawn from the most concentrated plume of repository-caused contamination in the aquifer. The estimates indicate that, for at least ten thousand years, the level of repository-yielded radioactivity this hypothetical person would likely receive, through all potential exposure pathways, would be far below fifteen millirem per year, the radiation protection standard for public health and safety. SEE ALSO C ANCER ; H EALTH, H UMAN ; R ADIOACTIVE W ASTE ; W ASTE, T RANSPORTATION OF . Board on Radioactive Waste Management, National Research Council, National Academy of Sciences. (2001). 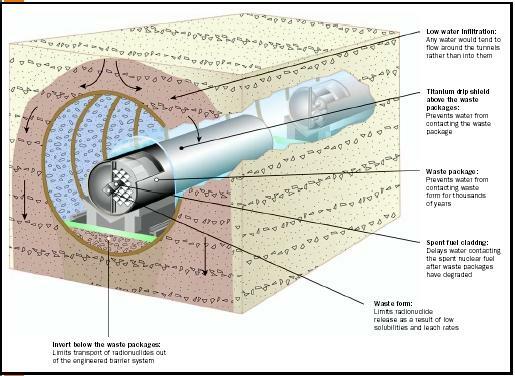 Disposition of High-Level Waste and Spent Nuclear Fuel: The Continuing Societal and Technical Challenges. Washington, D.C.: National Academy Press. Also available from http://www.books.nap.edu/books . International Atomic Energy Agency. (2002). Institutional Framework for Long Term Management of High Level Waste and/or Spent Nuclear Fuel. (IAEA-TECDOC-1323) Vienna, Austria: IAEA Press. Also available from http://www.pub.iaea.org/mtcd . Office of Public Affairs, U.S. Department of Energy. (2002). Why Yucca Mountain? Frequently Asked Questions. Washington, D.C. Also available from http://www.ocrwm.doe.gov/ymp . Wheelwright, Jeff. (2002). "Welcome to Yucca Mountain." Discover 23(9):66–75. Herne Data Systems Web site. "WasteLink: Guide to Radioactive Waste Resources on the Internet." Available from http://www.radwaste.org .